Chef Alessandro Pavoni, and his wife Anna, welcomed their daughter Jada on July 7. It was especially wonderful news because Alessandro had bone cancer two decades ago, and was told he would never be able to have children. He also had a double bypass after two near-fatal heart attacks three years ago. The Pavonis had five years of IVF, and suffered four miscarriages, before having Jada. Alessandro was born in Brescia, in Italy’s north, and worked at several Michelin-starred restaurants in Europe, including La Rotonde in Paris, before moving permanently to Sydney in 2003. He opened his own restaurant at The Spit in Mosman in 2009, and Ormeggio at the Spit has won several awards since then. Alessandro is well known as a celebrity chef on Channel Ten’s Masterchef. 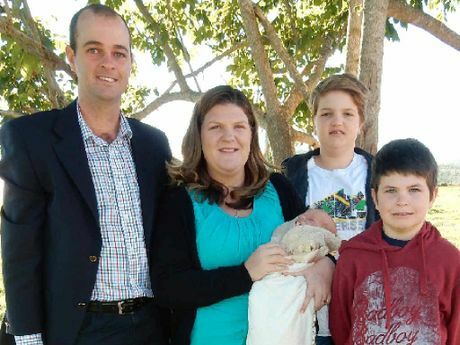 LNP candidate Matt Trace, and his wife Michelle, welcomed their fifth child early in July, and named their son Noah. Noah Trace joins big brothers Hayden, aged 13, Jacob, aged 10, Bryce, aged 4, and Liam, aged 2. Matt is a dairy farmer from Kenilworth in Queensland, and a cricket coach in his spare time. Matt has been selected by the Liberal National Party to stand for the seat of Nicklin against long-standing Independent Member Peter Wellington in the state election next year. Journalist Emma Heron, and her husband Brian Schafer, welcomed their daughter Ruby Sue earlier this month. Emma writes for the Chinchilla News in Queensland, while Brian is the Venue Manager for the Commercial Hotel in Chinchilla.